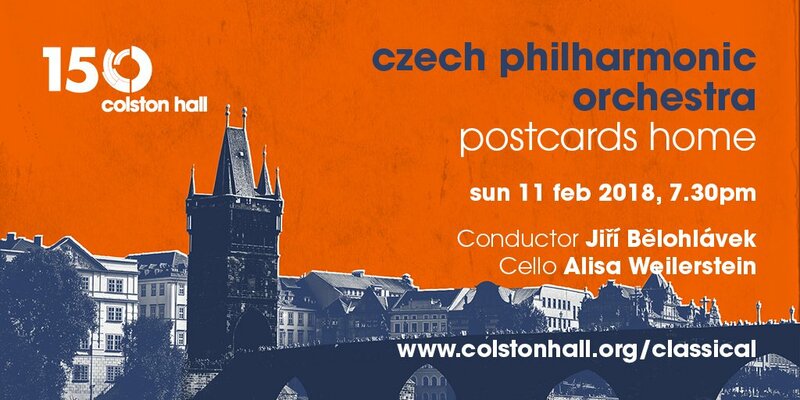 A double helping of Dvořák – including his homesick postcard home ‘From the New World’ – frames Shostakovich’s pithy concerto as the mighty Czech Philharmonic returns. Money talks. And when Jeanette Thurber made Dvořák an offer he couldn’t refuse the composer upped sticks to take over New York’s National Conservatory. One of the fruits was a symphony that entwines Old World Bohemian rhapsody and New World hustle and bustle in a work that instantly beguiled. Slower to make its way was the infinitely supple Symphonic Variations now ranked alongside Brahms’ ‘Haydn’ or Elgar’s ‘Enigma’, and which pave the way to a concerto with Shostakovich’s name, (musically encoded as DSCH) all over it – literally. To play the concerto is a cellist described by Seen and Heard International as “incendiary”; Alisa Weilerstein’s Shostakovich, moreover, harbours a “deep, dark intensity” (The Chicago Tribune). *This concert was originally to be conducted by Czech Philharmonic’s inspirational and much-loved chief conductor Jiří Bělohlávek who sadly passed away in May 2017. Tomáš Netopil has been appointed to conduct this concert. Netopil has worked with the Czech Philharmonic a great deal and was on e of Jiří Bělohlávek’s pupils and assistants who has in recent years conducted the Berlin Philharmonic, Leipzig Gewandhaus, Dresden Staatskapelle and many other major orchestras. Music educator and conductor Jonathan James interviews one of the world’s leading concert cellist Alisa Weilerstein ahead of her performance of Shostakovich’s concerto. Weilerstein releases her fifth album on Decca in September, playing Shostakovich’s two cello concertos with the Bavarian Radio Symphony under Pablo Heras-Casado, in performances recorded live last season. Her 2016-17 season also includes, for the first time in her career, performances of Bach’s complete suites for unaccompanied cello: at Caramoor, in Washington, DC, New York and in London. In January she embarks on a nine-city U.S. tour with longtime recital partner Inon Barnatan and clarinetist Anthony McGill, including a performance at New York’s Lincoln Center in Alice Tully Hall. The trio’s tour will include the world premiere of a piece written by Joseph Hallman specifically for this ensemble. She tours Europe with Barnatan later in the spring, with performances in Salzburg and a return to Wigmore Hall in London. Her busy international concert schedule this season features performances around the globe: she performs Britten’s Cello Symphony with the New World Symphony; Shostakovich’s First Cello Concerto with the Lausanne Chamber Orchestra, the Netherlands Philharmonic, and the National Symphony in both Washington, DC and Moscow; Prokofiev’s Sinfonia concertante with the Royal Stockholm Philharmonic and the Dallas Symphony; Schumann with the San Francisco Symphony, and at Carnegie Hall in the company of the Orpheus Chamber Orchestra, with which she then tours the same program to Italy and Spain; Elgar with the Staatskapelle Weimar; Walton with Amsterdam’s Residentie Orkest; and Dvořák with the Minnesota Orchestra, Sydney Symphony, and the Tokyo Symphony on a three-stop tour of Japan, where she will also play four solo recitals. The cellist also performs Henri Dutilleux’s Tout un monde lointain… with Lisbon’s Gulbenkian Orchestra, and gives the world premiere of Matthias Pintscher’s Cello Concerto with the Boston Symphony Orchestra, which co-commissioned the piece for her.